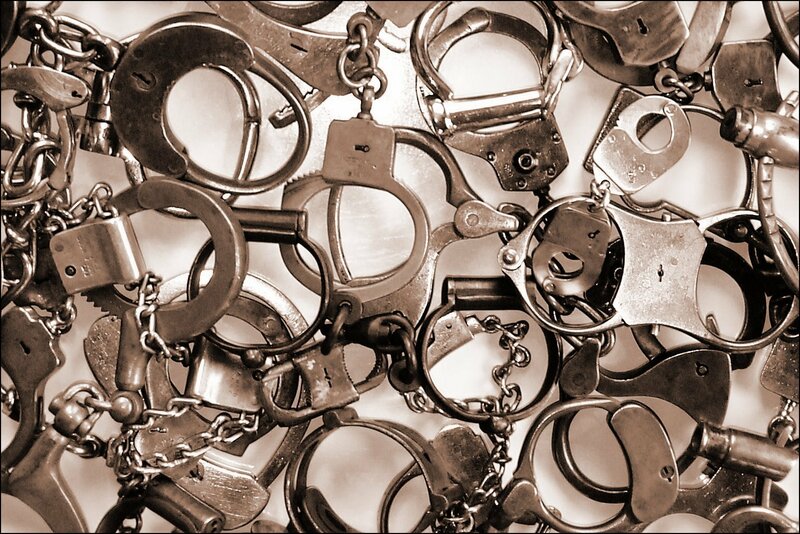 These pages present a guide to collecting handcuffs and related restraints. An emphasis is given to vintage American handcuffs, defined roughly as those made from the time of the American Civil war through the 1970s. A handcuff collection presents a fascinating look at the development of one small segment of modern industry. The handcuffs of the later 19th and early 20th centuries were of high quality, manufactured to a high standard, but the basic designs often left much to be desired. A great variety of competing handcuff models were marketed over these years, some were quite successful, others not. The information presented is in the form of a series of galleries and various feature articles. The galleries illustrate a collection of vintage handcuffsand other restraints, identified by name and date of patent or introduction. The articles each address one small part of the story. Some articles are dedicated to the products of individual companies that contributed to the evolution of handcuffs and restraints. Others may feature one particularly interesting item or event. Handcuffs and similar restraints have always been fascinating to people. Although their intended use as a tool of law enforcement is well understood by all and is indeed a bit frightening, handcuffs have captured the imagination of many. The great Houdini and his imitators entertained thousands of people by escaping from handcuffs and other restraints. They capitalized on everyone's need to escape the mundane, a desire to outwit the authorities, and simply a fascination with the bizarre. As part of our guide to handcuffs we will include the entertainment side with a look at Houdini and his fellow escape artists of the past. This web site is being initiated on a limited basis with a few selected items. More will be added as time permits. Your comments and suggestions are always welcome. Please send an email or visit the forum. Unless otherwise credited all text and pictures presented on these web pages are copyright © 2001 by Joseph W. Lauher. All rights are reserved. Text and pictures may not be copied without permission. Values How much are they worth? A Puzzle for the Experts Do you know your handcuffs? Unless otherwise credited all text and pictures presented on these web pages are copyrighted © 2004 by Joseph W. Lauher. All rights are reserved. Text and pictures may not be copied without permission.